He thinks Americans should kick and spit on Osama bin Laden's dead body before it is hung upside down on meat hooks at Ground Zero -- mirroring what Italians did with the body of Benito Mussolini at Piazza Loreto almost exactly 66 years ago. I understand his feelings. They make me a little queasy, but I understand. He is swept up in the national euphoria following the news that justice -- and U.S. forces -- finally caught up with the man who masterminded the death of thousands of innocent people on Sept. 11, 2001. My son has lived almost his entire life in the shadow of 9/11. He knows Ian Tawney, a dear friend from our hometown, died in Afghanistan because of what bin Laden's minions did that day. He heard me speak of Rick Guadagno, a gentle soul who managed a local wildlife refuge, who died on United Airlines Flight 93. That was the flight where passengers overpowered the terrorists and sacrificed themselves to prevent another attack. My son knows Ian, Rick and thousands of other people would be alive today if not for the man U.S. forces killed May 1. And he is happy bin Laden is dead. Me, too. So are countless millions across the world. 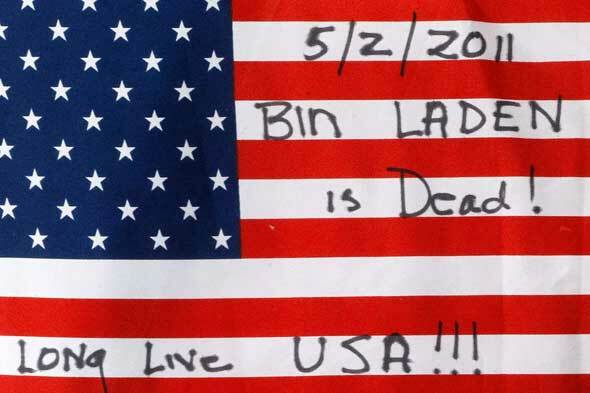 Bin Laden was a malignant tick our world was finally able to shrug off. My son asked how we will dispose of the body. I explained he was to be buried at sea in a manner rightly respectful of Muslim beliefs and practices. "Rightly respectful?" Was I mad? How could I say such a thing? Bin Laden was the worst villain humanity has produced since Adolf Hitler. His body should be shown the same respect he showed the bodies of the people in the World Trade Center and Pentagon. I reminded him of something John McCain once said about terrorists. "It's not about how they are. It's about who we are." And we are the United States of America. We stand for something. We stand for something when standing for something is the most difficult thing to do. We don't capitulate to anger and vengeance. When we treat our enemies with greater justice than they would treat us, we show the world (and ourselves) that we have the courage to pay more than lip service to our ideals. It's not just America that stands for something. So, apparently, do I. I asked my son how he would feel if I talked about how I wanted to desecrate bin Laden's body. He said he would hate it. "That's not you," he said. Exactly. We may have our private expressions of vengeance. But, like children, we want those we trust to mete out justice to be above such bitter motivations. We expect better things from our parents ... and our nation. Yes, bin Laden needed to be exterminated like a rabid rodent. And, yes, his death is cause for a certain amount of elation. Yet, let us not get too bloodthirsty at the necessity of taking a life. Let us not lose ourselves in the revelry. Rather, I tell my son, be glad that bin Laden can no longer hurt anyone else. We have wiped his evil from the earth. Let us replace it with light rather than continued darkness. "Rot in hell" screams this morning's front page in the New York Post. I told my son I understand the sentiment. But rather than praying for bin Laden to rot in hell, I would rather save my prayers for Ian, Rick and the thousands of other people who died nearly 10 years ago.